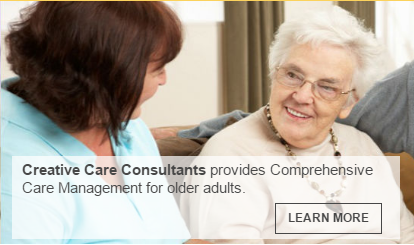 Creative Care Consultants provides Comprehensive Care Management for older adults. Creative Care Consultants will help you evaluate care options and develop the best plan. Our Mission: to provide essential and comforting care to elders at home, creating peace of mind for them and their families. Creative Care Consultants is a private geriatric care management company that specializes in assisting older adults and their families with long term care arrangements. Is an older adult or disabled loved one becoming more forgetful and confused? Are you concerned with their level of self care? Are you struggling with a decision between nursing home and in-home care? Do you live away and need the reassurance that the appropriate care is being provided to your loved one in their area of residence? Are you an attorney or guardian, responsible for the well-being of an older adult and needing assistance in exploring options and making choices? Creative Care Consultants can help you find the answers to these questions and more. Our professionally trained staff will help you evaluate care options and develop the best plan for the older adult with the available resources. We do this with warmth, compassion, and understanding because we know how important it is that the older adult population be able to maneuver through the later stages of life with the dignity, respect, self-esteem and confidentiality that they deserve. Do you have questions about your loved one’s needs? Contact us for a professional geriatric assessment by a registered nurse.